Top load laundry has been around since the 1940s, dating back to the invention of laundry machines. The most compelling benefit of a top load washer is pricing. Most top loaders range from $299 - $899 as opposed to $599-$1,299 for a front load washer. But there is way more to considering what washer would be right for you. We will look at front loaders, hybrids and then compare Speed Queen and Kenmore Elite. You are possibly considering a top load after having a front load. Top loaders are cheaper to fix than a front load machine. You also do not have to bend for a top load like a front load. The reliability averages are similar with top loaders being about 2% more reliable than front loads. However, top loads use more water, electricity and detergent with less capacity. So be advised. There are also two different types of types of top laundry. You are familiar with the traditional top load with an agitator in the middle. As we said, it has been around forever. Hybrids do not have an agitator. You do pick up the capacity, but the cleaning is not as good. The agitator stirs the clothes in this design, but that part is missing in the hybrid design. We do not show this type of washer at Yale, yet they are widely sold at Sears, Lowes, Home Depot and Best Buy. 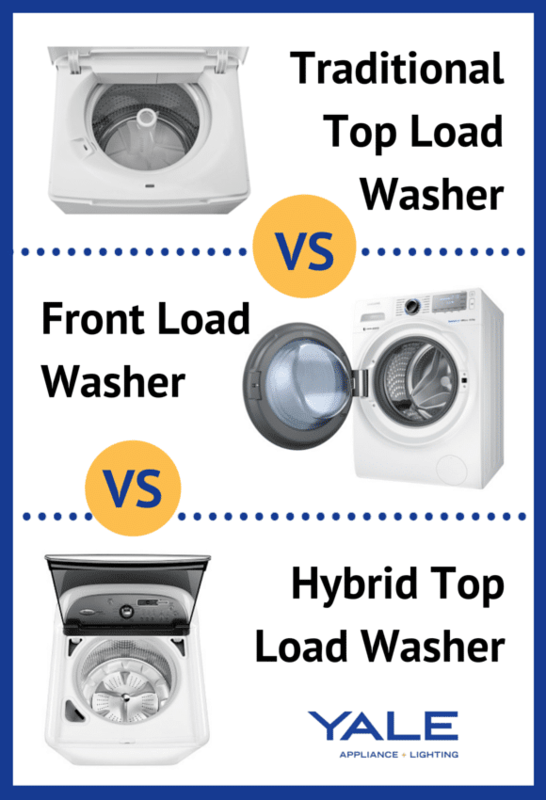 Speed Queen and Kenmore are two of the most popular laundry manufacturers in top loaders. Both companies are completely different. Speed Queen is known for its solid, rugged, and gimmicky machine; while Kenmore Elite is about modern mixed with high technology. In this article, we will look at both brands, the products and compare at the end. “Made in the USA” – has always been the proud statement from Speed Queen. Speed Queen is headquartered in Ripon, Wisconsin. Since 1908, Joe Barlow and John Seelig founded the company after purchasing several hand powered washing machine from a Kansas City company. The partners invented a better machine by increasing the machine's efficiency through high-speed gearing. Speed Queen has one distinct promise to its customer - built to last. The machine has a projected average last span of 25 years. Each machine is built with metal instead of plastic. Today, Speed Queen can easily be spotted in homes, laundry mats, hotels, hospitals, and military bases. They use the same platform for their commercial machines as their residential for reliability. Kenmore is owned by Sears (Sears, Roebuck & Co.) since 1927. Kenmore products can only be purchase at Sears or Kmart stores. There is no doubt the brand is big, because Sears has over 700 stores. Kenmore is actually manufactured by Whirlpool, Bosch, Roper, Amana, Haier, Corning, Samsung and Electrolux. 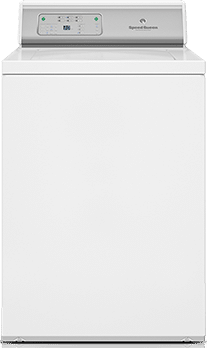 This particular top loader is made by Whirlpool. You can see the similar model under Whirlpool Cabrio WTW8100BW. The top loader doesn’t have the traditional agitator, therefore it use less energy than traditional top loaders. The unit is the newer generation high-efficiency top loader meaning it use less water (approx. 13-20 gallons vs 30-40 gallons of water). 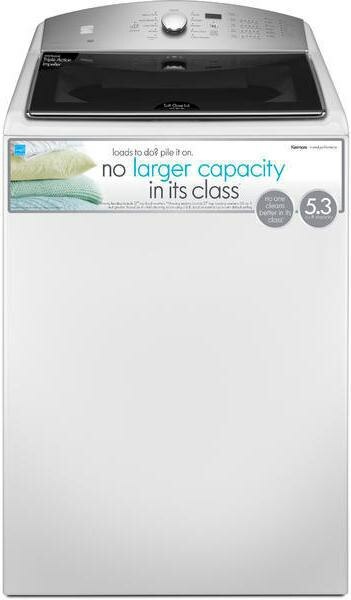 Since there is no agitator the washer has a 5.3 cu ft. tub meaning you can wash bulky blankets. 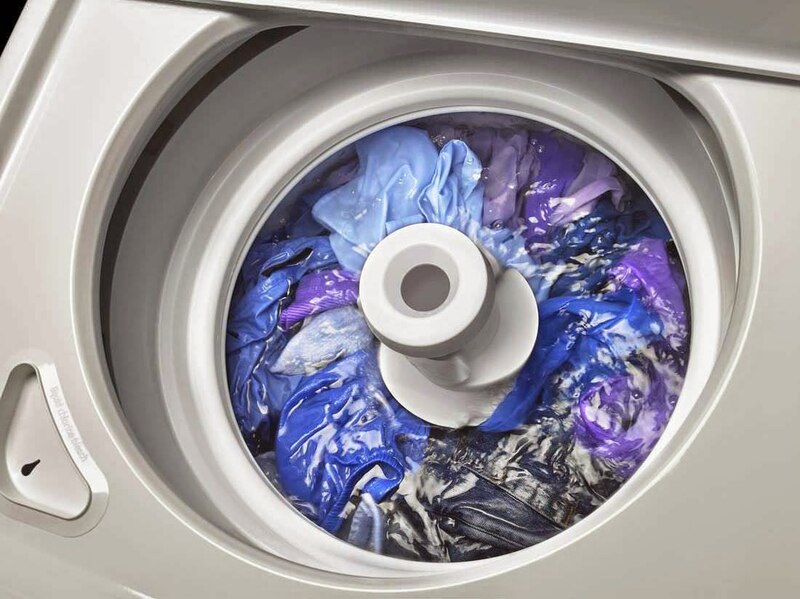 The unique triple action impeller uses a 3-part wash movement for tough laundry. The powerful spray jets and a burst of concentrated detergent help clean the clothes. From the looks of it – the machine looks like it was made in the early 1900’s, because Speed Queen hasn’t done much to the cosmetics. Their latest recent changed was adding the electronic control panel and a 5-year warranty on all the electric panels. The foundation of this machine is made of metal. You can’t push it around because it is solid. Because of the weight, the washing machine is stable at 710 RPM. This allows for better upper floor installation. The high grade stainless steel tub prevents from corrosion or damages. Speed Queen is a classic top load and is very simple to fix. It has been awhile since I sold a hybrid. If the latest machines work, this could be a good machine with plenty of options. The capacity is huge and a 950 RPM will pre dry the clothes due to the fast movement. However, I would check reviews, because a top load without an agitator still makes no sense. Speed Queen, on the hand, will be upholding its promise of better life without issues. However, $899 seems like a ton of dough for a top load machine even with a 5-year warranty. Read about Dishwasher features, specs and service ratings in our Washing Machine Buying Guide Buying Guide. Over 180,000 people have read our appliance and lighting guides so far. Danny Nguyen is an Appliance Sales Consultant at Yale Appliance + Lighting. Danny has completed 2 half marathons and enjoys spending time travelling and snowboarding.